Every good Chicagoan knows that while deep-dish pizza may be the first Chicago food that comes to the minds of out-of-towners, the TRUE Chicagoan’s favorite food is the Italian Beef Sandwich! 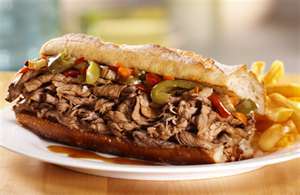 Luscious garlicky sliced beef baked with Italian seasonings, dipped in au jus and piled high on a warm Italian roll, topped with sweet or hot peppers (and sometimes ooey-gooey Mozzarella or Provolone cheese)….. YUM! Although recipes on the internet abound for Italian Beef sandwich “clones,” most use a crock-pot method which yields a mushy, stringy, sub-standard beef sandwich. I found this recipe quite by accident while Googling recipes for my favorite foods on the internet (what can I say—food obsession runs in the genes!) This one really piqued my interest! No all day cooking in a crock pot? No stringy chuck roast imposter? A true roasted beef with Italian seasonings? I just HAD to give it a try! Click for recipe. Oddly enough, the roast was on sale at my local market: buy one – get one free! A sign from the Chicago gods, perhaps? Quite excited, I baked up the roast per the instructions above and… Viola — the BEST home-made Italian Beef Sandwiches EVER!!! These were almost as good as those we Chicagoans know and love! Although I don’t have a meat slicer to get my slices paper-thin, I do pretty good with a sharp knife! [Uh huh. Is this where I tell everyone she sliced off the end of her finger once?] I would even consider purchasing a meat slicer for home use just for this recipe!! My husband, who will tell you exactly what he thinks of a recipe when asked [yeah, he’s not really shy], was so impressed with these, he actually bragged about how good they were to friends and family! Try this recipe and enjoy a true Chicago favorite! [Munchies’ Note: I LOVE Italian Beef sandwiches, and it’s one of the things I miss most about living in Kansas City. I used to eat at Luke’s regularly when I was in high school, and have been known to stop at Luke’s on the way to Mom’s when we drive into town. Portillo’s is another favorite for Italian Beef, Chicago dogs and cheese fries. I’ve found a pretty good Italian Beef sandwich at The Pizza Man in Lenexa, and they’ve got the good Chicago dogs as well. Place meat fat side up in a shallow pan that’s just large enough to hold the roast. Rub half of the seasoning mixture over the meat. Roast for 15 minutes; reduce temperature to 350 degrees and continue to cook 20 minutes longer. 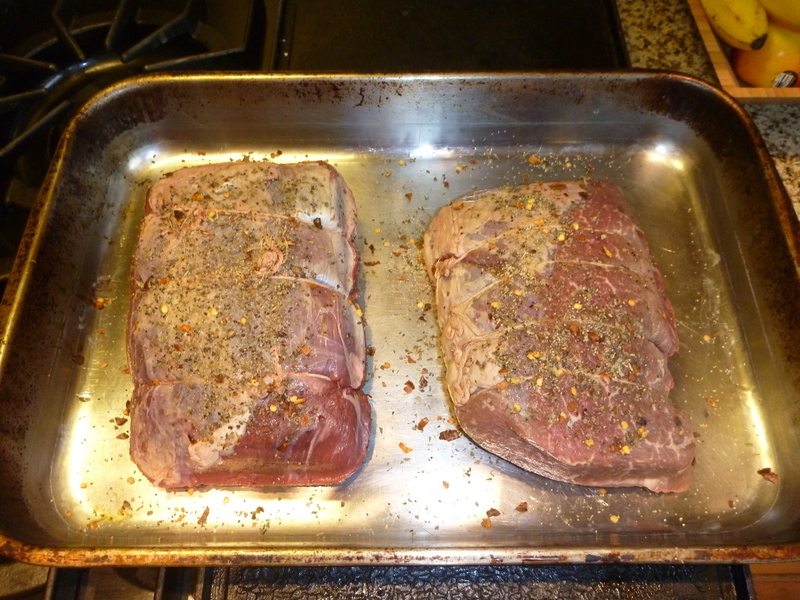 Remove from oven; pour beef broth and remaining seasoning mixture into pan. Return to oven. Cook just until the meat registers about 135 degrees on a meat thermometer, about 20 – 25 minutes. DO NOT OVERCOOK the meat! Meanwhile, stir the juices in the pan to loosen the spices if necessary, and transfer them to a saucepan. [There’s a lot of pepper in there, so if you want it really mild, don’t stir up all the spices!] Cook over medium heat until heated through – about 3 minutes. Regarding the Chicago-Style Italian Beef Sandwiches … Did you post a link to the recipe? I’m not able to find it, and I would love to give this a try! Sorry about that. Just added the link. Let me know what you think of it. I’m thinking of making it again this week. What instructions ‘above’. Am I missing something? Hi Jeff. Thanks for letting me know! Let me know if you try it. Thanks for stopping by! Oops – thanks for pointing that out! The recipe is on the Mix it Up! (Recipes) page. I’ve added the link. I LOVE THE ITALIAN BEEF SANDWICHES.I LIVE IN LUDINGTON MI, THEY DONT KNOW NOTHING ABOUT THIS SANDWICH, I MADE IT AT HOME , IM FROM CHI-TOWN BORN AND RISE, I MISS IT SO MUCH I LOOKED UP BIG AL”S RECIPE FOUND IT ON LINE BEEN MAKING IT EVERYSINCE.THEY ARE SO,SO GOOD,. I love Italian Beef! I’m lucky to have found one place in Kansas City who makes them the right way! « Is it The Best Blueberry Cheesecake?